Sea turtles can tolerate water temperatures down to about 50 degrees Fahrenheit and this means they are usually able to live year-round in all areas of Florida. The water temperatures in some of our shallow bay areas may drop below 50F for a while but then sea turtles just temporarily move to deeper, warmer water. However, sea turtles living in some shallow areas don’t have quick access to deeper water and may not be able to escape rapidly cooling water before becoming stunned. A cold-stunned sea turtle will become inactive, float at the surface and eventually wash ashore. These turtles are not only vulnerable to scavengers but will also die if their bodies remain at very low temperatures. During January 2018, we found a little over 1,300 cold-stunned sea turtles in Florida. This number was second only to the more than 4,500 found cold-stunned in Florida during January 2010. 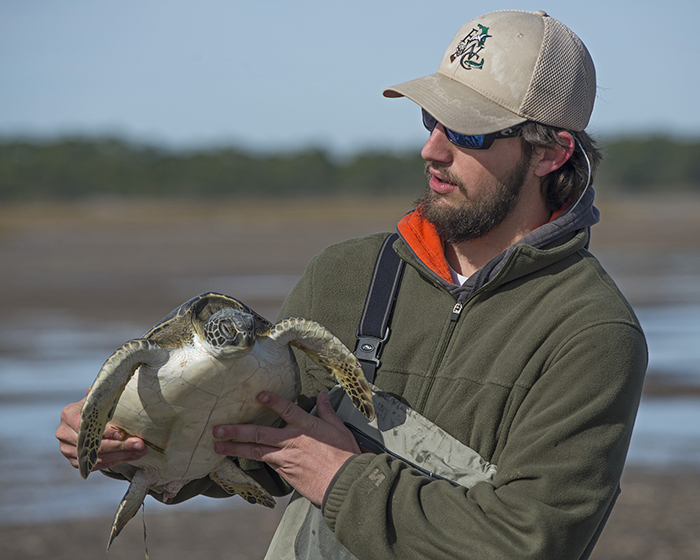 Most of the cold-stunned sea turtles found this year were in St. Joseph Bay (Gulf County in the Panhandle). Green turtles were the most commonly found cold-stunned but some Kemp’s ridleys, loggerheads and even hawksbills were also found. About 90 percent of these turtles were rescued and released after a short warmup period at a rehabilitation facility. View the Flickr album Cold Stun Sea Turtle Rescues 2018 for more information.